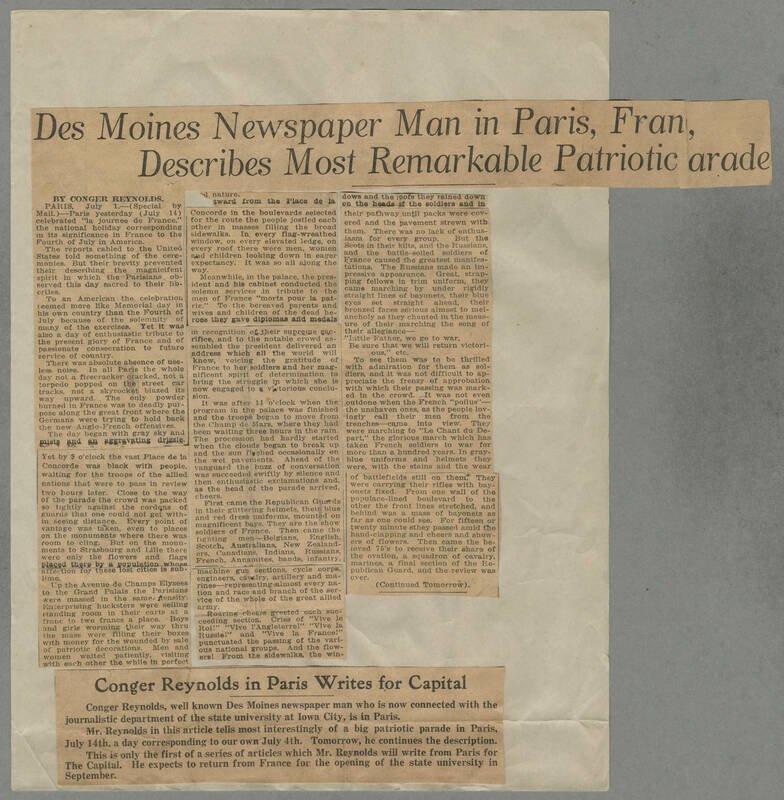 DIY History | Transcribe | World War I Diaries and Letters | Conger Reynolds newspaper clippings, 1916-1919 | 1916-07-01 Des Moines Capital Clipping: ""Des Moines Newspaper Man in From Paris, France, Describes Most Remarkable Patriotic Parade""
1916-07-01 Des Moines Capital Clipping: ""Des Moines Newspaper Man in From Paris, France, Describes Most Remarkable Patriotic Parade""
Des Moines Newspaper Man in Paris, France, Describes Most Remarkable Patriotic Parade BY CONGER REYNOLDS. PARIS. July 1.--(Special by Mail.) --Paris yesterday (July 14) celebrated "la journee de France," the national holiday corresponding in its significance in France to the Fourth of July in America. The reports cabled to the United States told something of the ceremonies. But their brevity prevented their describing the magnicifent [magnificent] spirit in which the Parisians observed this day sacred to their liberties. To an American the celebration seemed more like Memorial day in his own country than the Fourth of July because of the solemnity of many of the exercises. Yet it was also a day of enthusiastic tribute to the present glory of France and of passionate consecration to future service of country. There was absolute absence of useless noise. In all Paris the whole day not a firecracker cracked, not a torpedo popped on the street car tracks, not a skyrocket blazed its way upward. The only powder burned in France was to deadly purpose along the great front where the Germans were trying to hold back the new Anglo-French offensives. The day began with gray sky and mists and an aggravating drizzle. Yet by 9 o'clock the vast Place de la Concorde was black with people. waiting for the troops of the allied nations that were to pass in review two hours later. Close to the way of the parade the crowd was packed so tightly against the cordons of guards that one could not get within seeing distance. Every point of vantage was taken, even to places on the monuments where there was room to cling. But on the monuments to Strasbourg and Lille there were only the flowers and flags placed there by a population whose affection for these lost cities is sublime. Up the Avenue de Champs Elysees to the Grand Palais the Parisians were massed in the same density. Enterprising hucksters were selling standing room in their carts at a franc to two francs a place. Boys and girls worming their way thru the mass were filling their boxes with money for the wounded by sale of patriotic decorations. Men and women waited patiently, visiting with each other the while in perfect [?d?] nature. [?tward from the Place de la Concorde in the boulevards selected for the route the people jostled each other in masses filling the broad sidewalks. In every flag-wreathed window, on every elevated ledge, on every roof there were men, women and children looking down in eager expectancy. It was so all along the way. Meanwhile, in the palace, the president and his cabinet conducted the solemn services in tribute to the men of France "morts pour la patrie." To the bereaved parents and wives and children of the dead heroes they gave diplomas and medals in recognition of their supreme sacrifice, and to the notable crowd assembled the president delivered an address which all the world will know, voicing the gratitude of France to her soldier and her magnificent spirit of determination to bring the struggle in which she is now engaged to a victorious conclusion. It was after 11 o'clock when the program in the palace was finished and the troops began to move from the Champ de Mars, where they had been waiting three hours in the rain. The procession had hardly started when the clouds began to break up and the sun flashed occasionally on the wet pavements. Ahead of the vanguard the buzz of conversation was succeeded swiftly by silence and then enthusiastic exclamations and, as the head of the parade arrived, cheers. First came the Republican Guards in their glittering helmets, their blue and red dress uniforms, mounted on magnificent bays. They are the show soldiers of France. Then came the fighting men--Belgians, English, Scotch, Australians, New Zealanders, Canadians, Indians, Russians, French, Annamites, bands, infantry, machine gun sections, cycle corps, engineers, cavalry, artillery and marines--representing almost every nation and race and branch of the service of the whole of the great allied army. Roaring cheers greeted each succeeding section. Cries of "Vive le Roi!" "Vive l'Angleterre!" "Vive la Russie!" and "Vive la France!" punctuated the passing of the various national groups. And the flowers! From the sidewalks, the windows and the roofs they rained down on the heads of the soldiers and in their pathway until packs were covered and the pavement strewn with them. There was no lack of enthusiasm for every group. But the Scots in their kilts, and the Russians, and the battle-soiled soldiers of France caused the greatest manifestations. The Russians made an impressive appearance. Great, strapping fellows in trim uniform, they came marching by under rigidly straight lines of bayonets, their blue eyes set straight ahead, their bronzed faces serious almost to melancholy as they chanted in the measure of their marching the song of their allegiance-- "Little Father, we go to war, Be sure that we will return victorious," etc. To see them was to be thrilled with admiration for them as soldiers, and it was not difficult to appreciate the frenzy of approbation with which their passing was marked in the crowd. It was not even outdone when the French "poilus"--the unshaven ones, as the people lovingly call their men from the trenches--came into view. They were marching to "Le Chant du Depart," the glorious march which has taken French soldiers to war for more than a hundred years. In gray-blue uniforms and helmets they were, with the stains and the wear of battlefields still on them. They were carrying their rifles with bayonets fixed. From one wall of the populace-lined boulevard to the other the front lines stretched, and behind was a mass of bayonets as far as one could see. For fifteen or twenty minutes they passed amid the hand-clapping and cheers and showers of flowers. Then came the beloved 75's to receive their share of the ovation, a squadron of cavalry, marines, a final section of the Republican Guard, and the review was over. (Continued Tomorrow). -------------------------------------------- Conger Reynolds in Paris Writes for Capital ----- Conger Reynolds, well known Des Moines newspaper man who is now connected with the journalistic department of the state university at Iowa City, is in Paris. Mr. Reynolds in this article tells most interestingly of a big patriotic parade in Paris, July 14th, a day corresponding to our own July 4th. Tomorrow, he continues the description. This is only the first of a series of articles which Mr. Reynolds will write from Paris for The Capital. He expects to return from France for the opening of the state university in September.